There are a number of ways to provide AWS credentials to your .NET applications. One approach is to embed your credentials in the appSettings sections of your App.config file. While this is easy and convenient, your AWS credentials might end up getting checked into source control or published to places that you didn’t mean. A better approach is to use profiles, which was introduced in version 2.1 of the AWS SDK for .NET. Profiles offer an easy-to-use mechanism to safely store credentials in a central location outside your application directory. After setting up your credential profiles once, you can refer to them by name in all of the applications you run on that machine. The App.config file will look similar to this example when using profiles. The SDK supports two different profile stores. The first is what we call the SDK store which stores the profiles encrypted in the C:Users<username>AppDataLocalAWSToolkit folder. This is the same store used by the AWS Toolkit for Visual Studio and AWS Tools for PowerShell. The second store is the credentials file under c:Users<username>.aws. The credentials file is used by the other AWS SDKs and AWS Command Line Interface. The SDK will always check the SDK store first and then fallback to the credentials file. 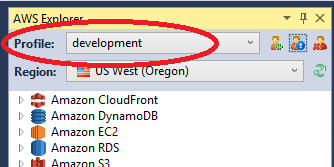 The Visual Studio Toolkit lists all the profiles registered in the SDK store in the AWS Explorer. To add new profiles click the New Account Profile button. When you create a new project in Visual Studio using one of the AWS project templates the project wizard will allow you to pick an existing profile or create a new profile. The selected profile will be referenced in the App.config of the new project. Profiles can also be setup using the AWS Tools for Windows PowerShell. Like the Toolkit these credentials will be accessible to the SDK and Toolkit after running this command. To use the profile in PowerShell run the following command before using AWS cmdlets. Profiles can also be managed using just the AWS SDK for .NET using the Amazon.Util.ProfileManager class. Here is how you can register a profile using the ProfileManager. You can also list the registered profiles and unregistered profiles using the ListProfileNames and UnregisterProfile methods. If you get the SDK from NuGet the package’s install script will add an empty AWSProfileName tag to the App.config file if the app setting doesn’t already exist. You can use any of the already mentioned methods for registering profiles. 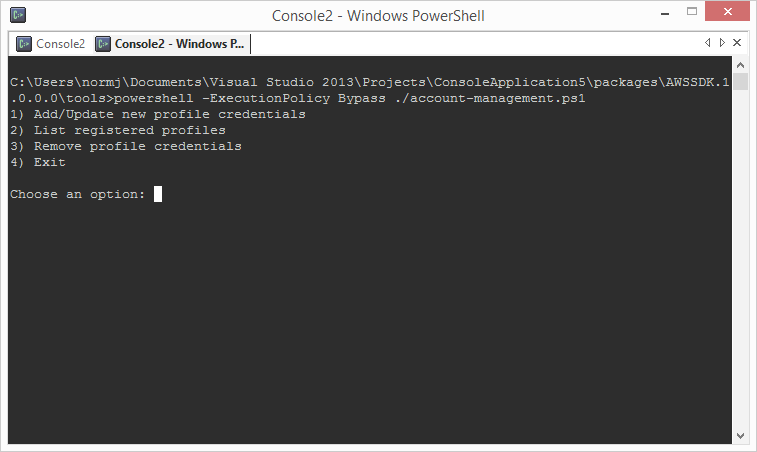 Alternatively, you can use the PowerShell script account-management.ps1 that comes with the NuGet package and will be placed in /packages/AWSSDK-X.X.X.X/tools/ folder. This is an interactive script that will let you register, list and unregister profiles. The previous methods for adding profiles have all been about adding credentials to the SDK store. To put credentials in the SDK store requires using one of these tools because the credentials are encrypted. The alternative is to use the credentials file. This is a plain text file similar to a .ini file. Here is an example of a credentials file with two profiles. When you create a service client without specifying credentials or profile name the SDK will search for a default profile. The default profile’s name is "default" and it will first be searched for in the SDK store and then the credentials file. When the AWS Tools for PowerShell was released last year it introduced a default profile called "AWS PS Default". To make all of our tools have a consistent experience, we have changed AWS Tools for PowerShell to now use "default" for the default. To make sure we didn’t break any existing users, the AWS Tools for PowerShell will still try to load the old profile ("AWS PS Default") when "default" is not found, but will now save credentials to "default" profile unless otherwise specified. If an application is creating a service client without specifying credentials then the SDK uses the following order to find credentials. Look for AWSAccessKey and AWSSecretKey in App.config. Important to note that the 2.1 version of the SDK didn’t break any existing applications using the AWSAccessKey and AWSSecretKey app settings. If the AWSProfileName exists then see if this profile exists. If no AWSProfileName is specified look for the default profile called "default" in the SDK Store. If the AWSProfileName exists then see if this profile exists. If no AWSProfileName is specified look for the default profile called "default" in the credentials file. These are credentials that can be found on EC2 instance that were created with instance profiles. It is also possible to specify the profile to use in code, in addition to using App.config. This code shows how to create an Amazon S3 client for the development profile. Both the SDK store and the credentials file are located under the current user’s home directory. If your application is running under a different user – such as Local System – then the AWSProfilesLocation app setting can be set to use an alternative credentials file. 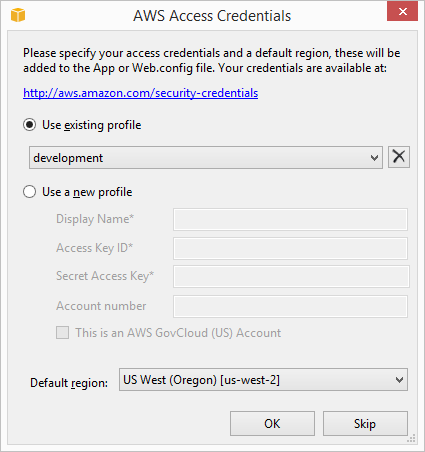 For example, this App.Config tells the SDK to look for credentials in the C:aws_service_credentialscredentials file.